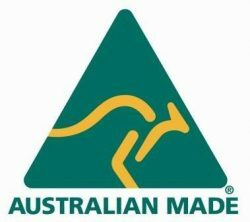 Looking to upgrade a tired bitumen playground with a vibrant synthetic grass basketball court that is free from trip hazards. Grass Solutions can repair your schools cracked, dipped concrete or bitumen surface prior to installation of your new artificial grass basketball court. Grass Solutions’ basketball court surfaces are 19mm sand filled synthetic grass, which provides optimum performance for ball bounce on a concrete slab or crushed rock base. They’re perfect for school grounds, to community playgrounds, sporting clubs and can be SCALED TO SIZE FOR BACKYARDS! Line markings for each basketball court are individually tailored, scaled to size and are always cut in with our Laser Cutter for precision line marking. We never paint line markings on, as they tend to rub off over time. 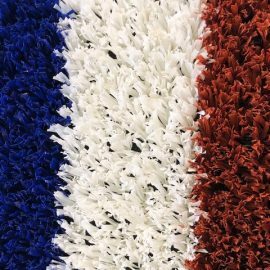 Basketball court synthetic grass IS available in green, rust, and blue. With the line markings, you have the choice of red, blue, yellow and white. Grass Solutions’ synthetic grass courts can be designed for multiple sports, with line markings integrated onto the court surface for netball, basketball, volleyball and bat tennis. Looking to create a half a half size court at home? Installing an artificial grass basketball practice court in your backyard will encourage the kids to get off the computers and go outside to practice, train and/or play. At the same time you can keep an eye on things! 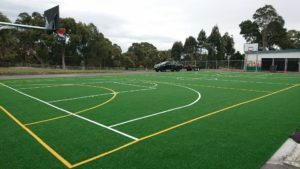 Court Turf PE – A 19mm synthetic grass field, green in colour. Designed for commercial use. With a total product weight of 1923gms/m2, it is a very wise choice for high usage/school installations. Challenge Pro PE – A 19mm artificial grass that is one step above the rest, with the added attribute of double backing and a high stitch rate. It is ideally suited for busy basketball clubs, schools and commercial centres. In addition to basketball court synthetic grass, be sure to ask about the supply and installation of court accessories, including tower, netting and lighting.